With you on that, had to look it up. It’s amazing the little differences between American and British English. 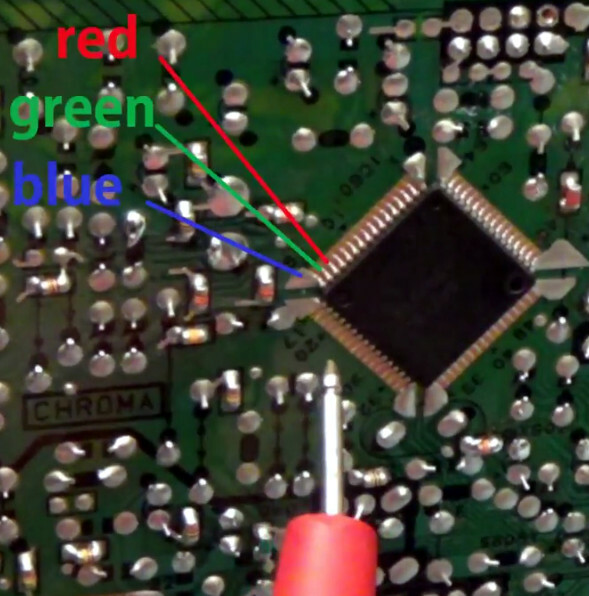 Most TVs with SCART sockets accept RGB on pin 15/11/7 if you pull pin 16 high. Oh, your CRTs over there didn’t have SCART? No, but we had nearly 10% more horizontal scan lines. And a 20% faster refresh rate. I doubt that. PAL and SECAM have 625 scan lines with 576 containing image data. vs NTSC having 525 total, with maybe 480 visible on a good day. scart is the only connector i know of that repels the socket. I hated them when i had to use them, but after a few ritual burnings, i’m over that now. I recall fiddling with one out of curiosity in a hotel room in Europe as a kid, and also recall having great difficulty getting it plugged in and/or working again. US tv didn’t had SCART , only composite and RT , later component. One might be lucky, and find a tv set which has a board used for multiple models, and luckier still to find space or SCARY or RGB. Then it’s a matter of populating the board with the missing components. A lot of the consumer TV’s have Y-Pb-Pr aka ‘component’ input. Often they use R-G-B coloured jacks, bit the signal is different to true RGB. Sometimes you get lucky though and the TV will accept either signal on those inputs. I knew just how close I came to killing myself that moment. Had that gone from one finger to, say a finger on the other arm, I’d be dead. By a miracle, the current flowed from one finger tip to an ADJACENT fingertip… it hurt SO bad, but I was SO relieved to not be dead! I had graduated high school the very day before. I can’t even imagine how awful it would have been for my family if they’d found me in my room, dead, then… I’ve since more than doubled my age, so I must’ve at least learned SOMETHING from the stupidity of youth! I still deal with CRTs from time to time, but I am FAR more observant, and far more respectful of them now. It’s a good idea, except it’s for people that seek to kill themselves. simply wet your finger and poke it in a CRT based TV. But, the concept described here is usable, simply make a very high resistance brush of sorts instead and use that as probe. color CRT itself uses RGB signal. It’s a matter of figuring where the signal comes from and feeding RGB signal in the right places. If necessary, cut off the old signal amp and separator circuit so it won’t try to feed black signal and drag down injected RGB signal. Hogwash. You’ve got red green and blue phosphors to hit, so it _must_ be converted somewhere along the line! Yes, three signals are sent to the tube socket, there’s usually a little board with a transistor for each of Red, Green, Blue lines. I don’t suppose the RGB from the game is strong enough to inject there, but at least it well defines those points. Maybe upstream a better place can be found. I’m surprised one has to guess. CRT tv sets re enough in the past that I would think datasheets are available for many of the ICs, which would give insight into where one could attach RGB. One does have to figure out where to inject a sync signal, and perhaps one has to combine them before injecting, depending on the tv set. If you use an old enough TV, you can get the Sams packet on it and get a schematic. I’m wondering who this guy talked to because anyone with any real arcade experience would have told him that it’s quite possible to hack certain crt tvs into an arcade monitor. If nothing else, arcade repair people have been pulling the tubes from old tvs since the industry began. That being said it isn’t always practical to use the tv’s pcb due to the fact that some arcade boards (Nintendo, ect.) have odd syncs, sometimes a video amp is needed and the circuitry might not be isolated. Swapping tubes is fairly common, but they reuse the old board and yoke from the arcade monitor. There are also signal converters that convert the signal to composite or S-video. The method of direct-injecting signal into the original TV circuit board has been done before, but it isn’t common and it can be hard to find info on how to do it, much less a video walkthrough. I think most people say “It can’t be done” because it’s an easier answer than “It’s possible, but it’s hard to find information about it and good luck trying to find a walkthrough” and then answering the barrage of follow-up questions that come after. Often, the person asking is usually someone new to the hobby who has little or no experience with electronics, much less tracking down signal input on a pcb. If you do a google search on converting a TV to an arcade monitor, 99% are how to match a TV tube to your existing arcade yoke. Yes I know all of this, thus my reply. I don’t know of anyone in the arcade community that would say “it can’t be done” though. The more common response is “it isn’t worth doing” due to safety concerns if you don’t know what you are doing, the things I mentioned in my original response and the annoyance of not having sync adjustment pots on most modern crts. That being said, that sort of response made more sense back in the day when you could get a good used arcade monitor for practically nothing, now that the last crt factory for arcade monitors closed it’s doors, people in the hobby might have to start dirtying their hands with hacks like this one. Then again an arcade monitor pcb can be restored almost indefinitely via periodically installing cap kits so we are back to tube swapping again.